SWIMMING: To say he is proud is an understatement. Once again Tom Fronek has coached his Gladstone Gladiators to precision in their training cycle to return some brilliant results on the weekend at the Biloela Bluefins Open Preparation Meet. Gladiators used this meet as an indication on their training progress. "As part of our training cycle, the 100m and 200m freestyle were the events that we have been working on," Fronek said. "Our older swimmers were mainly focussed on the 100m and 200m freestyle and we needed to step up and produce good results, which they did. "All of our swimmers in these events delivered excellent results." 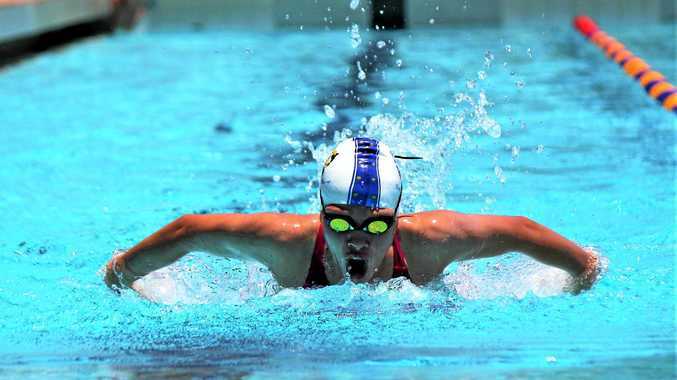 The younger swimmers were racing in their usual mix of events. They also produced some awesome times and delivered great results. It was a great event for the Gladiators with 24 gold medals, 28 silver, 23 bronze with 86 personal-best times achieved and it produced state qualifying times once again. Stand out all-round performances were recognised with Age Champion trophies awarded to Kai Devine 11, Kane Martin 12, Federica Tiboni 14, Stephanie Elliott 14, Clara Furness 15 and runner-up to Rhiannon Copsey 13 and Jake Devine 15. The Gladiators swimmers next assignment is the City of Charm in Bundaberg on November 23-25. "The next three weeks will be heavy work for us as we focus on doing well in Bundaberg," Fronek said. "In the meantime, we also play host to the Liquid Energy carnival on November 17." Gladstone Gladiators will also hold a Club Night and Come and Try this Friday from 6pm. If you are new to swimming or want to know more about what swimming can offer you, please come along and see what we do - it is open to everyone.